In this page, you will learn about the Singapore Goods and Services Tax, more commonly known as GST. We will help you understand the definition of GST, its registration requirements, as well as the pros and cons of GST registration. Singapore GST is a tax charged on the supply of goods and services made in Singapore and on the importation of goods into Singapore. The current rate for GST is 7%. What goods and services are subjected to GST? All goods and services are taxable and known as taxable supplies. However, some items are specifically exempt from GST by law. Exempted items include financial services and the sale or lease of residential properties. Your business must be registered to collect GST if your annual turnover exceeds or is likely to exceed S$1 million from the sale of taxable goods and services. This requirement may be waived if most of your goods or services are exported or supplied internationally (“zero-rated supplies”). You may also apply to the Comptroller of GST to collect GST voluntarily. Approval for voluntary registration is at the discretion of the Comptroller. Once approval is given, you must remain registered for at least two years. GST is a broad-based consumption tax levied on the import of goods (collected by Singapore Customs), as well as nearly all supplies of goods and services in Singapore. The only exemptions are for the sales and leases of residential properties and the provision of most financial services. Export of goods and international services are zero-rated. In some countries, GST is known as the Value Added Tax (VAT). It is compulsory for businesses to come forward to register for GST when their turnover exceeds $1mil per year. Businesses that do not exceed $1mil in turnover may register for GST voluntarily. “Taxable turnover” is the total value of all taxable supplies made in Singapore (excluding GST) in the course or furtherance of business. 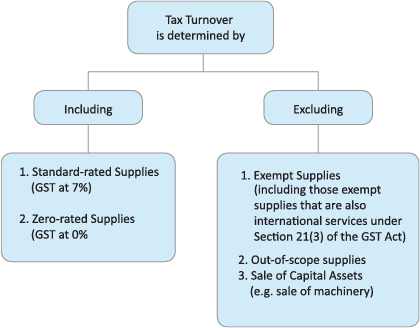 This includes the value of all standard-rated (GST at 7 %) and zero-rated (GST at 0%) supplies but it excludes exempt supplies, out-of-scope supplies and the sale of capital assets. For the purpose of determining your liability for GST registration, the value of exempt supplies that are international services under Section 21(3) of the GST Act should also be excluded from your total taxable supplies. When am I liable to register for GST? You are liable to register for GST when your annual taxable turnover exceeds S$1 million or you are currently making taxable supplies and your annual taxable turnover is expected to exceed S$1 million. How to determine my liability to register? You can determine your liability to register for GST using the prospective or retrospective view. The table below summarises your liability to register, notification of liability and effective date of registration under each of the two views. Your liability will arise if: At the end of any quarter*, where the total value of all your taxable supplies made in Singapore in that quarter and the previous 3 quarters have exceeded S$1m. If you expect that the value of your taxable supplies in the next 4 quarters will not exceed S$1m, you are not required to be registered. However, please note that if the value of your taxable supplies for the next 4 quarters subsequently exceeds S$1 million, the Comptroller will backdate your GST registration. At any time, if there are reasonable grounds for believing that the total value of your taxable supplies in the next 12 months will exceed S$1m (You must be currently making taxable supplies to come under this basis. Otherwise, you should apply for voluntary registration). You are required to apply for GST registration: Within 30 days of the end of that relevant quarter*. Within 30 days from the date on which you made a forecast that your taxable turnover for the next 12 months will exceed S$1m. Your date of registration will be: End of the month following the month in which the 30th day falls. End of 30 days from the date of your forecast. * Quarter means a period of 3 months ending on the last day of March, June, September or December. Note: You should commence charging GST with effect from the date you are registered for GST. GST paid on your business purchases and imports can be claimed from this date onwards. I am an overseas trader with no establishment in Singapore but I am making taxable supplies. Can I register for GST? An overseas trader who contracts to sell goods in Singapore can register in his own name. The overseas trader must appoint a local agent to be responsible for all GST matters, i.e. collecting GST on local taxable supplies made or filing GST returns promptly, etc. For the overseas trader to appoint a local agent, a letter of authorisation must be submitted together with the form GST F1 “Application for GST Registration”. If there is a change of local agent, a letter of authorisation is required to enable us to update our records. To create a pro-enterprise environment, Singapore has several assistance schemes relating to GST. These schemes generally help to ease the cash flow for businesses. Goods and Services Tax Assistance Scheme. Zero GST Warehouse Scheme (ZGS). Businesses can transform their warehouses into zero-GST warehouses to minimise red tape and bypass the GST process. Need help with GST registration and filing? Liaise with a dedicated specialist when you engage us for our taxation services. Our account specialists will attend to every step of your application thoroughly.